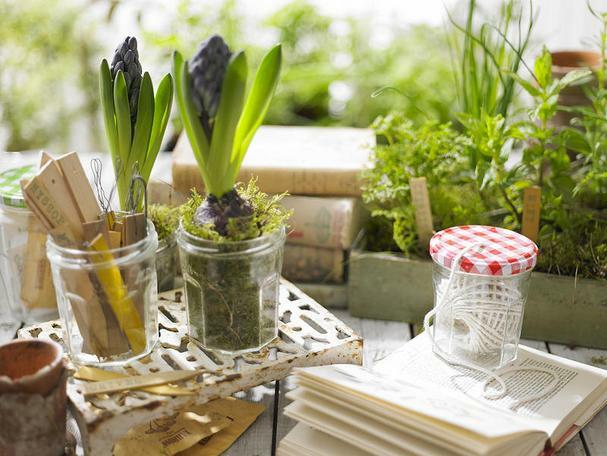 In celebration of Earth Day we’re exploring ways to reuse some of those commonly recycled items like jam jars. We love the pretty French labels and the charming red and white checkered lids of Bonne Maman jams and preserves. They’re almost too pretty to throw away, right? Spice racks are expensive, but here's an easy and inexpensive way to organize your spices (shown above). 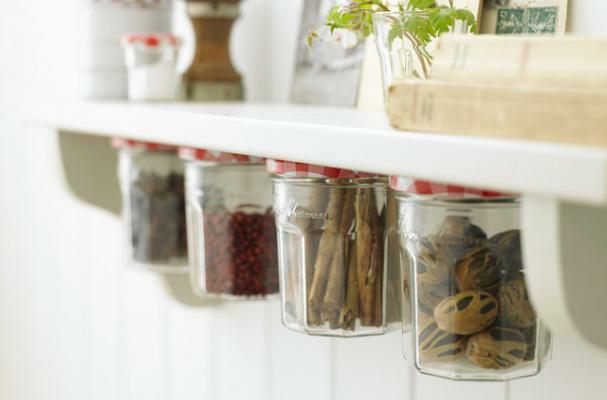 Simply mount lids (all you need are a few small screws and a power drill) on the underside of a shelf, fill jars with your dried herbs and spices, and screw the jars on the lids. Get some craft labels to write the names of the spices and you're all set! Mounting lids on a shelf or in a cabinet are also an excellent way to keep office items like rubber bands, staples, tacks, and such organized. Save a few more lids and jars for organizing screws, nails and other utility room or garage items. Jars are a super inexpensive way to keep all your bobbles neat and tidy, plus they look cute! 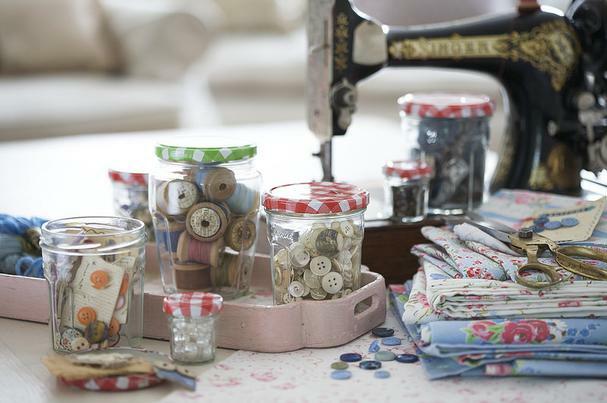 Buttons, pins and needles, spools of thread, and other little items all fit neatly in jam jars. 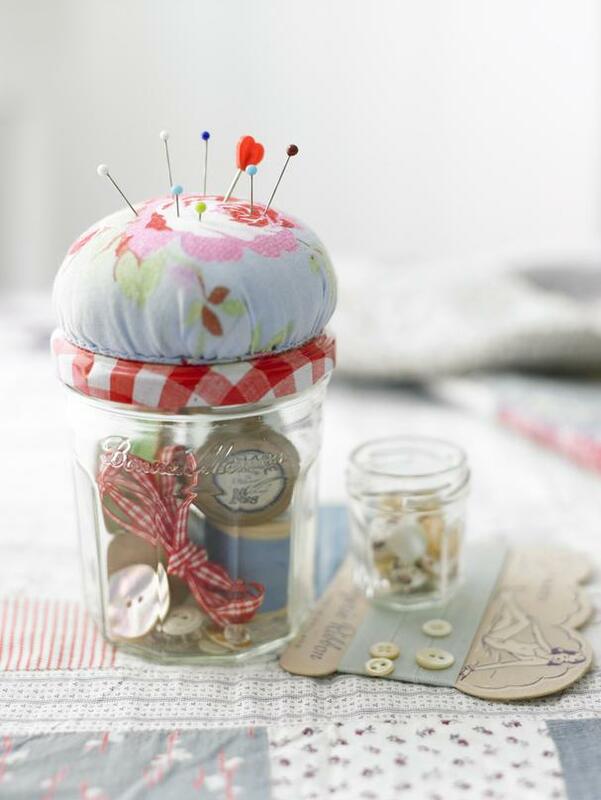 Top a lid with a cute DIY pin cushion! What are some of your favorite "upcycle" ideas? We'd love to hear!